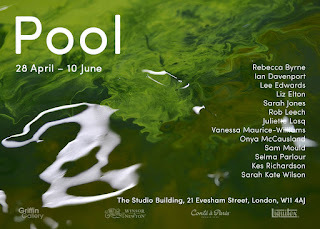 Griffin Gallery is delighted to present the group exhibition Pool, exploring the expanded field of painting via the device of a constructed landscape, a garden, with works brought together as an immersive experience. Thirteen artists, all of whom work in and around painting, have been asked to make work that alludes to this theme. As the show has developed, new connections between the works have become apparent, and aims have altered and shifted. The construct of a garden has acted as a frame in itself, with ideas embedded in individual pieces moving in and outside its own boundaries. The show begins before walking into the gallery with paintings that appear and disappear with blasts of steam. Entry to the body of the show is via an immersive work that also presents a tunnel into another world. Once inside, viewers will find suggestions of paths with glimpses and vistas appearing as they progress, both of the garden of works itself and landscapes beyond. Embracing the openness and inclusivity that is implied by the expanded field, Pool includes framed 2D pieces, moving out into sculptural work, video and performance. Works that are hung on the wall discuss space; interior space, the spatial language of painting,the space outside the painting as paint pools and sits on the surface of its support.Continuing to move beyond the frame, time is embedded in many of the works, the deep time of geological formations, the contemplative time of walking, the present time of performance, and future time in work that will decompose, to be shown again in a new form. Viewers are encouraged to engage with the show directly through deckchairs that can be moved around the space, and a bench for conversation. A performance will happen during the show, unannounced, working with and around the works, possibly undocumented, probably leaving no trace. A path leads to a door in the wall, offering a glimpse of a flickering pool, and the process of washing pigment is shown in a swirling film, suggesting the endless possibilities of painting. Rebecca Byrne explores interiority and the psychological impact of space in her paintings. In particular, her interest lies in the spaces that people inhabit, the traces left behind in abandoned spaces and thresholds into fantastical places that cannot exist. Recent exhibitions include ‘The Poor Door’, A-Side B-Side Gallery, London (2015), ‘The Red Files’, Schwartz Gallery, London (2015) and ‘Art Athina’ with Lubomirov-Easton Gallery, Athens (2015). Byrne is also beginning a Supported Residency at The Bothy Project in 2016. Ian Davenport is famous for his abstract paintings, which are executed by letting paint pour over canvases, boards and aluminium panels, tilted so that the final composition is determined in an interaction between gravity and the paint's viscosity. He has shown extensively worldwide including: Galerie Hopkins, Paris; GalerieSlewe, Amsterdam; Paul Kasmin Gallery, New York; Hakgojae Gallery, Seoul, Korea andDan Galeria, São Paulo. Lee Edwards works in a scrupulously detailed manner across various different mediums; his practice is frequently engaged with personal subject matter. Recent shows include solo exhibitions at GimpelFils (2008) and Domobaal (2011, 2016), and Lee has also curated a number of exhibitions. He has been featured in several publications including Time Out, Elle and Saatchi’s Art and Music Magazine. Lee is represented by Domobaal. Liz Elton brings gestural painting together with landscape, exposing her paintings to the environment. Documentation serves as work, remnants are reused, and compostable paintings look towards their future destruction. Recent shows include ‘EnPlein Air’, Mecklenburgh Square; ‘Art Athina' with Lubomirov-Easton; ‘Continuum of Ceaseless Change’, A.P.T. and ‘The John Moores Painting Prize’, Walker Art Gallery. ‘Atmosphere’ was screened at the Gate Cinema, Notting Hill, following a showing of ‘Mr. Turner’. Sarah Jones’s work draws on legacies of minimalism and literal theatricality, embracing and ramping this up as a part of picture making. Recent exhibitions and performances include Studio Hollybush Gardens, ‘hmn edition 1’, ‘Summer Rising’ IMMA Dublin and ‘Spoken Weird’ at Whitechapel Gallery. Jones completed her PhD in Painting at the Royal College of Art and is Resident in Critical Practice at the Royal Academy Schools 2014/2016. Jones has no website. Rob Leech describes his practice in the context of a sensory experience;“When you go to an Indian Restaurant there is always a dish that comes out still sizzling. I want that dish, and I don't want the sizzling to stop.”Recent exhibitions include ‘Painting in Time’, The TETLEY, Leeds; ‘Apocalyptic Future Games’, No Format, London and ‘Altered Terrain’, Associated Gallery, Brooklyn, New York. Leech is also the Director and Curator at FORT, London. Juliette Losq makes work concerned with the detritus of an almost forgotten past with which our daily experience is littered. Drawn installations, employing shifts in scale and imagery, evoke the chaotic nature of marginal spaces, conjuring a sense of whimsical curiosity that invites the viewer to explore them. Selected group exhibitions and awards include: ‘John Moores Painting Prize’, Finalist and Visitor’s Choice Award (2014); ‘Complicit, Coates and Scarry’ at Gallery 8, London (2015); ‘Ghosts’, FAS Contemporary, London (2015) and Jerwood Drawing Prize (2015). Vanessa Maurice-Williams’ work concerns wayfinding through large-scale installations that concentrate on the threshold/the portal. The scale is of fundamental importance - immense and comical, the works loom above the viewer, fighting for their attention. Recent exhibitions include: ‘Socially Engineered Machine’, The Control Room, Bristol and ‘Midden’, VulpesVulpes, London. Maurice-Williams was shortlisted for the Derek Hill at the British School at Rome and Bloomberg New Contemporaries (2014). Sam Mould is a landscape artist whose practice occurs through a translation of physical time-based actions. Cartography of location, place and time emerges through different mediums as a way of being in and moving through and connecting with site, memory and landscape. Recent exhibitions include A.P.T. Gallery (2014) and The Jerwood Drawing Prize (2012). Mould also writes for PaintUnion and had a residency with The Bothy Project (2014). OnyaMcCausland’s work explores underlying, often overlooked or hidden histories and narratives between geological materials and humans. Her new earthwork Charcoal Measure 2016can now be seen in the Forest of Dean Sculpture Trail. Recent exhibitions/projects have been supported by Newlyn Gallery (2009), Kettle’s Yard (2010), the Delfina Foundation (2012), and Camden Arts Centre (2014). She is currently showing new prints at the Royal Academy, and is completing a PhD at the Slade UCL in 2016. Selma Parlour’s paintings are meticulously rendered through soft films of transparent oil on linen so that imagery looks drawn or printed. Central to her invented vocabulary are: the frame, flatness, surface, bands and units of isolated colour and trompe l'oeil illusion. Recent exhibitions include a solo show ‘Paradoxes of the Flattened-out Cavity’, DioHoria, Mykonos, Greece (2015), as well as ‘Selma Parlour & Yelena Popova’, Horton Gallery, New York (2012) and‘The Creative Cities Collection’, The Barbican, London (2012). Kes Richardson makes paintings in a range of ways employing a growing resource of reoccurring motifs and visual languages. Currently, discarded paintings have become fodder for new works with an interest in the physicality of the medium and its construction together with the use of visual game-play, puns and structures. Recent exhibitions include 'Demolition Derby' at FOLD, London, 'P' at Horatio Junior, London and 'Garten a.V.' at Frontviews Temporary, Berlin. Richardson is represented by FOLD. Sarah Kate Wilson makes paintings that continue to evolve as they exit the studio. These works are kept alive by presenting them as events, through the use of ephemeral materials, by directing others via instructions to interact with them and by working with performers. Recent solo exhibitions include ‘Iris’, BALTIC 39, Newcastle and ‘Projected Paintings’ at Armory Center for the Arts in Pasadena, California. Group exhibitions include ‘Painting in Time’ (2014), which she co-curated at The TETLEY, Leeds.